Taking two steps for every grown up's one step, kids try hard enough when it comes to exploring the great outdoors. A smaller version of Smartwool's timeless classic, the Hiking Medium Crew, the Kid's Hike does not fall short on the big-time comfort of our adult version. Taking two steps for every grown up&apos;s one step, kids try hard enough when it comes to exploring the great outdoors. A smaller version of Smartwool&apos;s timeless classic, the Hiking Medium Crew, the Kid&apos;s Hike does not fall short on the big-time comfort of our adult version. With soft, luxurious SmartWool next to their skin and four color choices, your kids&apos; feet will be ready to go, even if they&apos;re not. Merino wool, nylon and elastane blend. Strong, Durable construction and materials. 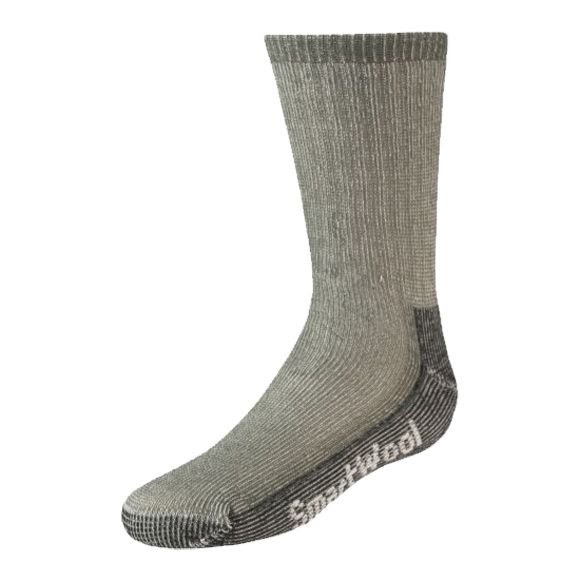 SmartWool&apos;s fibers offer the most efficient moisture-moving system on the market. Transports water while it&apos;s still in the vapor stage, before it condenses(keeps you drier longer). Works with your body&apos;s heating and cooling system, keeping you cool in the summer and warm in the winter. Suitable for a wide range of conditions. Dryness means an enviroment that is inhospitable to odor-causing bacteria.